'Mineral Survey,' 2015, marker and pencil on paper. Courtesy of the artist and Jack Shainman Gallery, New York. "I think the investigative nature of my work came forward, and it was less about Blackness with a capital B and the monolithic definition [of blackness], and more about how dynamic that definition is." Toyin Ojih Odutola critiques an outlet that explores a universal black experience in portraiture. A true artist of her craft, Toyin creates a particular style of work that challenges her to create a language that evokes emotion and feeling. Using different materials such as charcoal, pastel and ballpoint pens, her highly detailed images and dense drawings creates amazingly textured renderings that depicts the true essence of pure blackness. Using herself as her subject, Toyin shows the many ways a person can be described and the possibility that any one person can be fully captured by one image. "Odutola’s portraits explore how to desegregate blackness from a fixed racial position and open it out to all the mythology, missteps, racism, beauty, and life that is held by the term, while still landing it within the free space of bodies. She engages blackness as a field of tonality", says Claudia Rankine, contributor writer, who reflects on the intricate drawings of Toyin's work in “Vision & Justice” issue (2016) of Aperture. 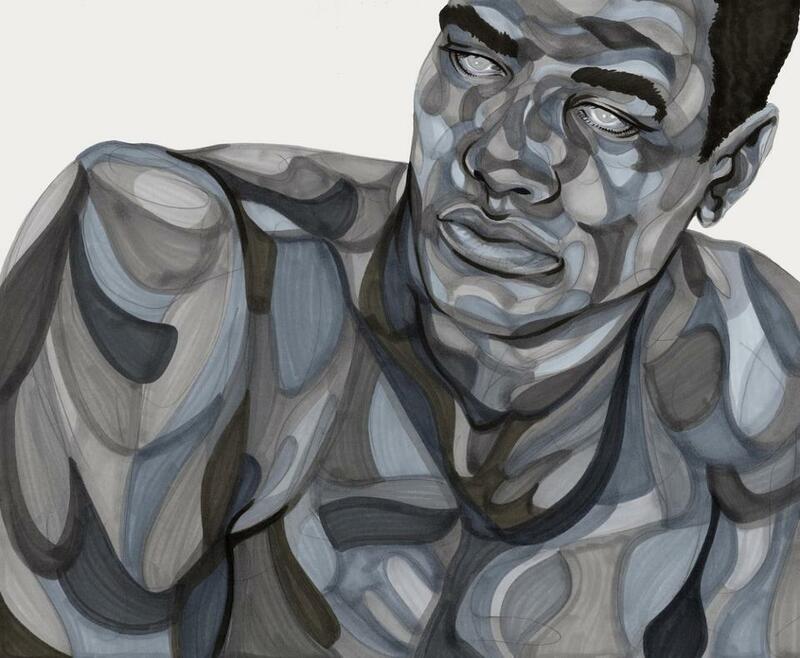 Toyin Ojih Odutola has participated in solo and group exhibitions at several institutions, including the Contemporary Museum of Art St. Louis, Seattle Museum of Art, Brooklyn Museum, Indianapolis Museum of Contemporary Art, National Academy Museum of Art in New York, Studio Museum in Harlem, Aldrich Contemporary Art Museum, Chinese Culture Center of San Francisco, and the Menil Collection. She has held residencies at Headlands Center for the Arts, Tamarind Institute, Flying Horse Editions, and Yale University’s Summer Art Fellowship. Her works are in the public museum collections of Baltimore Museum of Art, Birmingham Museum of Art, Philadelphia Museum of Art, Whitney Museum of American Art, Hood Museum of Art at Dartmouth College, Maier Museum of Art at Randolph College, Honolulu Museum of Art, and the National Museum of African Art (Smithsonian Institute, Washington, D.C.). The Treatment 21, 2015, pen ink and pencil on paper. Courtesy of the artist and Jack Shainman Gallery, New York. Quality Control , 2015, marker and pencil on paper. Courtesy of the artist and Jack Shainman Gallery, New York.